The young man in the bowler hat is sitting on the grass under Scarthin Rock beside the Derwent. On the opposite side of the river are the lawns of Willersley Castle. The publisher, by giving this the title 'from Willersley Road' really means that this is the view from the riverside track. 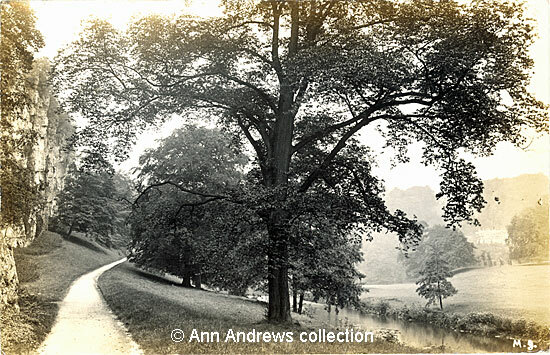 When this picture was taken there was one of Willersley Castle's gatehouses, Willersley Rocks Lodge, at the A6 end of the path; the lodge was demolished when the A6 was widened. St. Mary's Chapel is at the other end, on Mill Road (see "Cromford Church and Bridge", linked on the right). The large property on the hillside is Woodbank and the hillside is known as Harp Edge. The hand coloured card is not quite an accurate depiction as we learn from an article about one of the farms on Cromford Moor that one of the views the farm enjoyed to the north was "the red roof of Woodbank amongst the dark foliage". The Reverend Richard Ward wrote in 1827: "On the left of the same entrance into the dale [i.e. from Cromford where the turnpike road had been blasted through Scarthin Rock] is a high and steep hill called Harp Edge : this is the termination of the lofty mountainous country, which bounds the whole valley of Matlock on its western side". 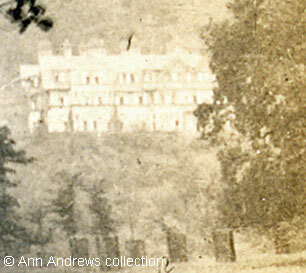 The second image was taken a few years later and from slightly further away from the river. We can see the limestone escarpment of Scarthin Rock as well as the path that connected the two castle lodges. It is interesting to see the neatly mown grass on either side of the path. The photographer is once more facing Harp Edge, and over Willersley Castle's lawns we can make out the shape of Woodbank although it is less clear than in the top picture. The message on this card reads "Another view from my bedroom window. You see Woodbank on the extreme right of the card". A pencilled additional note says:"(The grounds at Woodbank)". The photograph would have been taken for the Co-operative Holidays Association, a group who leased the house for a number of years from 1911 onwards. 1. 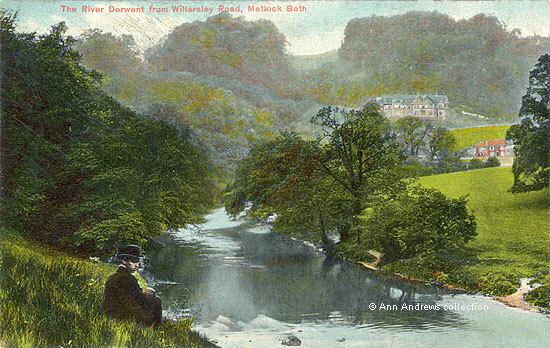 "The River Derwent from Willersley Road, Matlock Bath". Derbyshire "Artistic" Series, G Marsden & Son, Wirksworth and London, No.1998. Posted 12 Sep 1919 at Wirksworth. Personal message not relevant to picture. Another version of this card was posted in 1906. 2. [Woodbank - from Scarthin Rocks]. Published by Hirst, Photo, Birch Vale, via Stockport, Ref: M. J. Written and posted the same day, 10 Nov 1912, at Matlock Bath. Both images © Ann Andrews collection. "Derbyshire Advertiser and Journal", 13 October 1911. This was George Taylor's farm, leased from F. C. Arkwright of Willersley Castle.